Have you ever watched a movie and imagined how amazing it would be to be a part of the magic? Any Star Wars fans ever dream battling the Dark Side? Well, young visitors to Disney's Hollywood Studios in Walt Disney World get the chance to do just that. Jedi Training: Trials of the Temple allows children between the ages of 4 and 12 the chance to train with a Jedi Master, become an expert in the ways of the Force, and then do battle with Dark Side foes like Darth Vader. This experience is entirely free (yes, you read that right. . .FREE!) with your admission to Hollywood Studios, but space is limited. In order to make the most of your experience, here is everything you need to know. Getting Registered - You cannot pre-register for the Jedi Training Academy. 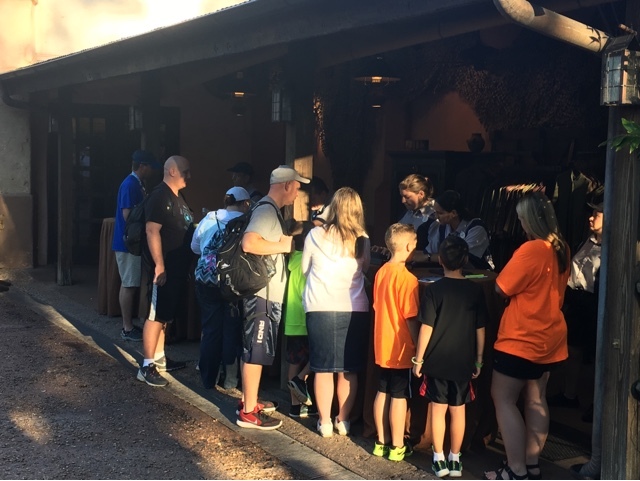 Registration takes place each day at Hollywood Studios and you want to get there early in order to secure your spot. We arrived at Hollywood Studios around 8:15 for a 9:00 opening that day. Around 8:30, cast members began welcoming guests into the park. 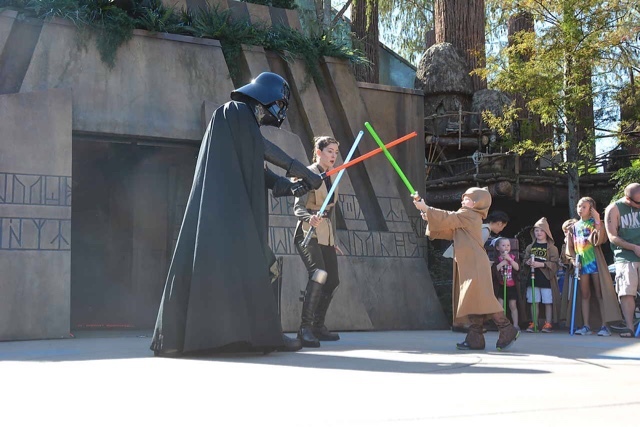 Guests who were looking to head towards Sunset Boulevard, Pixar Place, and other parts of the park were held back by ropes once inside, but signs directed those signing up for Jedi Training to head over to begin the process. The registration takes place back by Indiana Jones Epic Stunt Spectacular. Even though we entered at rope drop and were in line before 8:40, the line was still incredibly long. After about a 20 minute wait, we were able to sign up. 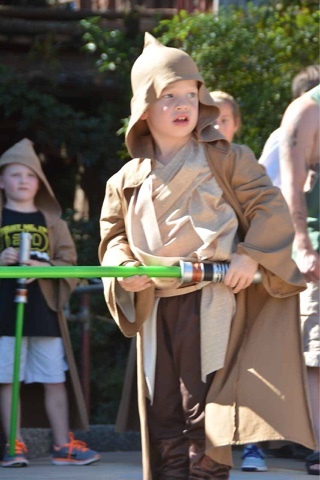 Don't forget that your little Jedi needs to be with you to sign up. They show runs multiple times throughout the day and you get to select your time based on availability when you arrive. The earliest show we could get that day was 11:40 AM so we scooped it up. Along with our confirmation ticket for the training, we also received three FastPasses good for the entire family. 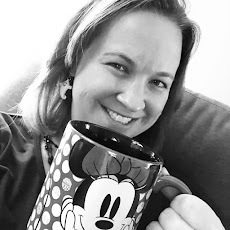 I don't know if this happens all the time, but my guess is that these FastPasses might be a way for Disney to let guests be flexible in selecting their time for the performance - if you have to schedule during a FastPass+ reservation time, no worries. Checking In - The check-in for the Jedi Training Academy is directly in front of the 50's Prime Time Cafe. You'll notice some blue circles on the sidewalk and that's how you'll know you are in the right spot. They ask you to arrive 30 minutes before your show time. 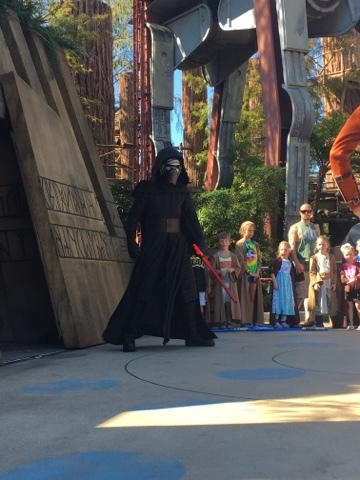 This allows the cast members to check guests in, get them cloaked up, go over PhotoPass information with the family, and give directions to the young Jedi. I stayed here with Brody while my husband headed over towards the stage to grab a good viewing spot. It doesn't matter what circle your kid stands on; everyone will get a chance to battle the Dark Side. While cast members were getting the kids ready, a PhotoPass photographer came over and shared with us information on accessing the pictures they take during the performance. Remember, all of these images are yours for free if you've purchased Memory Maker. 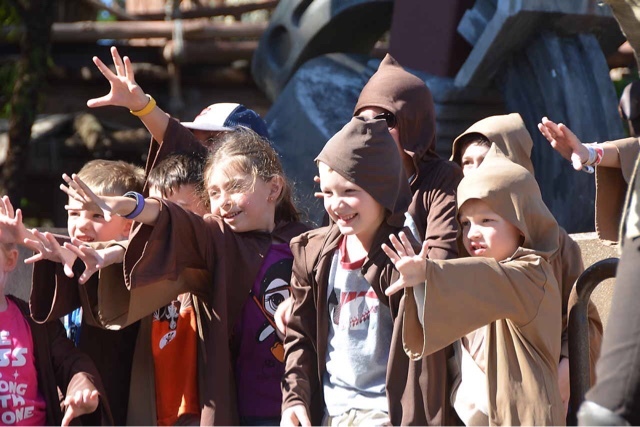 About 5 minutes before showtime, cast members will lead the future Jedi and their parents over to the stage to begin. The Show - The stage is located next to Star Tours: The Adventure Continues. When the kids arrive, they take a spot on stage based on the line they are in. Again, no worries about which line they are in - both get the chance to train and do battle against the Dark Side. The Jedi Masters teach the kids the ways of the Force and some lightsaber battle techniques. After some practice, smoke fills the stage and villains from the Dark Side emerge. The villains may vary from show to show, but we had Darth Vader and the Seventh Sister. 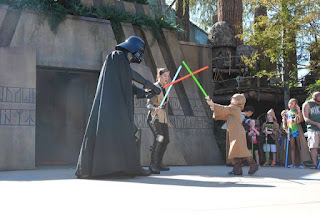 Brody was so excited and volunteered to be first to do battle with Darth Vader. 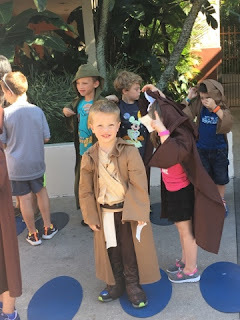 The show is extremely organized with the Jedi-in-Training lined up and ready to fight as soon as one is done. Once everyone completed their battles, those two disappeared, but it wasn't long before Kylo Ren emerged. 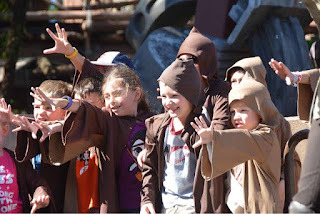 The kids did not do battle with Kylo Ren, but they used the power of the Force that now flowed through them to cause him to retreat. From check-in to the finale of the show, the whole experience lasted about an hour and was one of the most memorable from our trip. The pictures from the Disney PhotoPass photographer were priceless and Brody couldn't stop talking about his encounter with Darth Vader. I would highly recommend this free experience to anyone with a young Star Wars fan - just be sure to arrive to the park early to secure your spot as all shows do fill each day and they typically reach capacity very early on in the morning.